The following Terms and Conditions of use apply to the sale of goods ("Products", "Accessories", “Items” or "Parts") by PartSimple.com ("The Company", "Site", "We", "Our", or "Us") to Customers ("Customers", "You", "Your", and "Yours") through PartSimple.com. These Terms and Conditions may not apply to purchases made by Customers directly from the manufacturers we support, or in any manner to other forms of procurement a Customer may use to attain similar goods. Read the following Terms and Conditions carefully before using the Site as no other terms apply. By using or accessing this Site You acknowledge that You have read and agreed to these terms. PartSimple.com grants You permission to view this Site for Your own personal use provided that You agree to and accept without modification the notices, Terms and Conditions set forth in the "Terms and Conditions of Use". You may not copy, modify, distribute, transmit, display, reproduce, publish, license, create derivative material from, transfer information, or sell any material, information or products from this Site. As a condition of Your use of this Site, You represent and warrant to PartSimple.com that You will not use this Site for any purpose that is unlawful or prohibited by these terms. PartSimple.com continually updates and revises the products that it sells through this Site. As such, Products may be discontinued at any time and differences between what is shipped and what is described may occur on occasion. While PartSimple.com will use all reasonable efforts to fulfill any and all orders it receives, the Company cannot guarantee the availability of a particular Product displayed on the Site. While PartSimple.com strives to provide a helpful and error-free Site, we cannot guarantee that all content is 100% accurate, certifiable and/or complete, including price, inventory, product information or specifications. Proper use, description and specification of all items sold by PartSimple.com should be verified/confirmed by the manufacturer. As such, PartSimple.com reserves the right to correct price errors as they are discovered, revoke any stated offer and to otherwise correct any errors, inaccuracies, or omissions. This right extends to orders that have already been submitted by a Customer and accepted by PartSimple.com. We sell many more products than just those we keep on hand. Consequently, we have two policies regarding returns and cancellations based on the product being ordered. To simplify this process, we group all of our products into two categories, "Standard Orders" and "Special Orders". An item is considered "Standard Order" if it is available in physical stock at the time an order is placed. All items that do not meet the "Standard Order" criteria are considered, and noted as “Special Order" items. All orders placed on this Site are subject to product availability and will be shipped according to PartSimple.com shipping policies. Standard Ground: 5-7 Business Days, from the day that it leaves our warehouses. Expedited: 2-3 Business Days, from the day that it leaves our warehouses. Express: 1 Business Day, from the day that it leaves our warehouses. Cut off time for same day shipment: 2PM US Central Time. You may pay for Your orders with major credit/debit cards: Currently we accept Visa®, MasterCard®, Discover®, American Express® and Paypal. 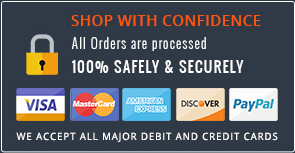 Generally, credit and debit cards are not charged for Standard Orders until we ship the item(s) to You, at which time You will be charged only for the goods we have actually shipped along with any appropriate taxes or shipping charges. However, we may pre-authorize Your order amount with Your credit or debit card issuer at the time You place the order, which may have an effect on Your available credit line. Please contact Your credit card issuer for more information. If You ordered a Special Order item along with a standard item, You will be charged the full amount when the order is placed. While You go through the checkout process You will acknowledge that Your item is a Special Order and that You agree to these Terms and Conditions. Special Orders can not be Cancelled. See Terms and Conditions upon checkout for more information. After You place an order using our shopping cart, we will check the information You give us for validity, by verifying Your method of payment and/or shipping address. We reserve the right to reject any order You place via PartSimple.com, and/or to limit quantities on any order, without giving any reason. If we reject Your order, we will attempt to notify You using the e-mail address You have given us with the order. Your receipt of an electronic or other form of order confirmation does not signify our acceptance of Your order, nor does it constitute confirmation of our offer to sell. PartSimple.com reserves the right at any time after receipt of Your order to accept or decline Your order for any reason. The total price of any order will include applicable state sales taxes only. All other taxes which may be applicable are the sole responsibility of the Customer. Returns must be authorized by contacting PartSimple.com to obtain a Return Authorization Number. Authorization does not guarantee credit. PartSimple.com will issue credit to the Customer upon receipt of the return package. A restocking fee of 15% of the purchase price can be deducted from any refund given. Authorized returns must be received no later than 30 days from the date of original shipment to the Customer. Packages received thirty (30) days after original shipment date may not be accepted and may subsequently be returned to the Customer. All returned products must be in resalable condition, including: all components, manuals, registration cards, and original undamaged packaging. In addition, the following restrictions apply: Credit cannot be issued for electric or electronic parts that have been installed. Some returned parts may incur a restocking fee equal to 15% of the purchase price. Owner's Manuals, Service Manuals, Instruction Booklets, Software (including but not limited to Restore CDs) may not be returned. Please see "PROCESS FOR RETURNING MERCHANDISE" below. An unauthorized return is defined as any package returned to PartSimple.com without the proper return authorization code on the shipping label. Unauthorized returns may include any package refused by the Customer during a delivery attempt. Unauthorized returns received by PartSimple.com may be refused at the warehouse and returned to the sender. In this case, the Customer may be held responsible for the cost of shipping the package back to the sender. This cost will be passed along to the Customer either in the form of a deduction from the total credit due to the Customer or a charge to the credit card if refund has already been issued. Any credits issued may be delayed. All returns must have an RA number for processing. Contact PartSimple.com here to receive a Return Merchandise Authorization number. RA's are only valid for thirty (30) days from the date of original product shipment to the Customer. Include the RA number on the outside of the package: RA numbers should be clearly displayed on the return shipping label of any package being returned to PartSimple.com. Do not write the RA number on the actual box. Packages without an RA number on the return shipping label will not be accepted. A refused shipment occurs when the Customer refuses to accept the package during a delivery attempt. Customers who refuse delivery in place of contacting PartSimple.com to obtain proper return instructions may be assessed a fee to cover return shipping and labor charges. This cost will be passed along to the Customer in the form of a deduction from the total credit due to the Customer. In addition, refused shipments may be considered an unauthorized return and subject to the policies thereof. We will issue credit within 10 business days from the date the item is received at our warehouse and approved for a refund. It may take Your credit card company up to 2 billing statements to post it. Credit will be issued for item cost, tax less any re-stocking fees and shipping charges (where applicable). PartSimple.com has a thirty (30) day refund policy on all "Standard Order" items. Each returned item must be returned with all packaging and materials and in the same condition it was received within 30 days of the items original shipment. PartSimple.com offers no refunds, no exchanges and no cancellations on all "Special Order" items. Sales of all "Special Order" items are final at the time the order is placed. In cases where "Standard Order" and "Special Order" items are purchased on the same order, "Standard Order" item policies remain in effect for the "Standard Order" items, and "Special Order" item policies remain in effect for the "Special Order" items. To minimize complications relating to product availability and accounting, PartSimple.com does not offer exchanges unless it’s a warranty exchange for the same item. If You need to change the product You have received, please return the product, as per Our Returns Policy, and place a new order on Our website for the item You want. PartSimple.com may, at its sole discretion, terminate Your account or Your use of PartSimple.com at any time. You are personally liable for any orders that You place or charges that You incur prior to termination. PartSimple.com reserves the right to change, suspend or discontinue all or any aspects of PartSimple.com at any time without prior notice. This agreement supersedes all prior or contemporaneous communications and proposals, whether electronic, oral or written, between You and PartSimple.com with respect to this Site.